I had my birthday last May and hubster took me out to Chillis to eat. Normally, I would order the usual meat wraps or sandwiches or burgers. But that night, I thought I would try some of their more obscure dishes. So I ordered what is called the Chipotle Chicken Fresh Mex Bowl. Mex for Mexican I guess. 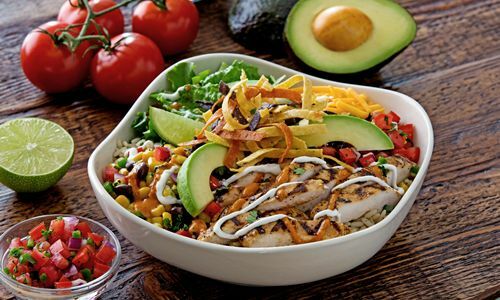 You can see from the picture below that this is what it looks like exactly advertised in the menu. Looks interesting and rather substantial right?…………..Here’s my beef; when the dish came, the avocados were like in thin slithers. THIN SLITHERS! The thickness of it does not even fall into the category of SLICES but measly slithers. You know what, I am fairly reasonable. 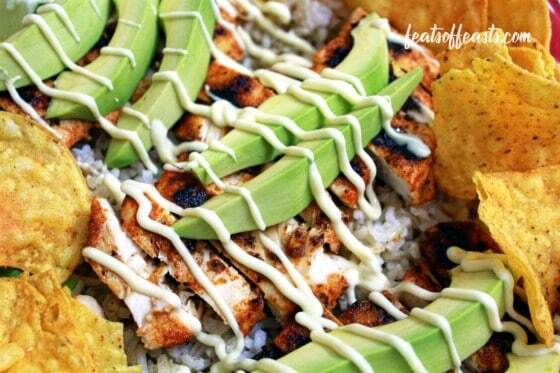 I know avocados are like precious metals here but if you’re going to serve a dish that has avocados…..make sure you give avocados instead of begrudgingly fulfilling what was stated on the menu. So the main problem was the portion of everything else except the rice and bean salad. 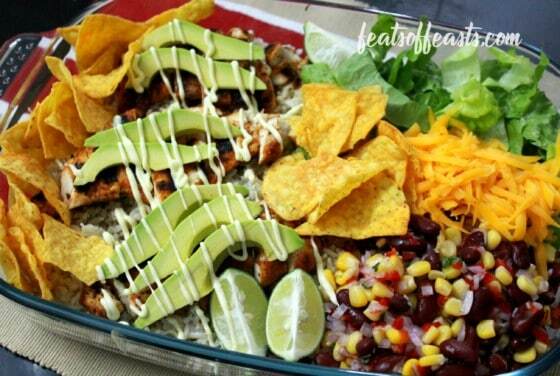 There was a lot of rice and the beans and corn but everything else was like….portion control to some degree of ridiculousness. And I also want to say the chicken was hard too, like it was cooked before and left to sit for some time. Okay, I do this thing where I go to places and have their food and think to myself…I can recreate this at home and probably better too. Better in the sense that I will make it generous so it will not leave you feeling like ‘There should be more of this’ or ‘There should be more of that….’ And that’s what I did. 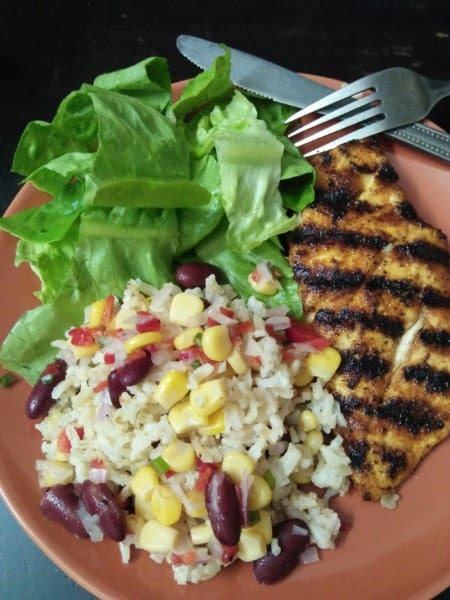 Although, I will not call it a Mexican rice anymore because the red beans are Italian and I used like Cajun spice mix for the chicken and used some of the Nandos ready sauce instead of Chipotle. The sauce is not like a major thing to the dish. When you have the beans and corn, you don’t really need moisture from a sauce. 1. Flatten the chicken breasts so that it’s leveled and even. Sprinkle the cajun seasoning on the chicken on both sides. Add some salt to season. 2. Grill in a hot pan till they’re cooked and slightly charred. Dish on a plate and leave to rest. 3. Prepare your other ingredients like the salad, cheese, limes and the salad. 4. To assemble, take a big flat dish and place the cooked brown rice first. 5. 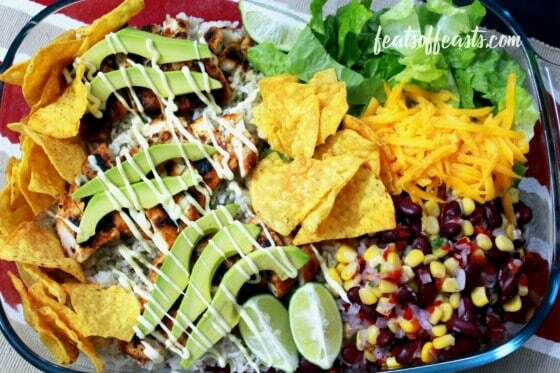 Add the toppings next, the salad, the cheese, the lettuce, the grilled chicken, avocados, limes and chips last. 6. Add your sauces and eat! 1. Prep and place all the ingredients in a bowl but do not mix them yet. 2. 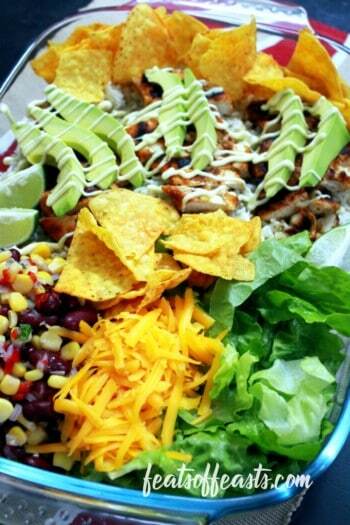 Mix the dressing together. Taste and adjust. 3. Pour it into the beans and corn. 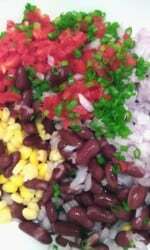 Mix gently with your hands because using salad utensils might crush the beans. I can’t tell you how bemused my kids are having chips for dinner. can arrange it however you like. There’s even more for leftovers the next day and you can have it however you like it.